Ferdinand Bol captured the dramatic moment in the Old Testament when Joshua "lifted up his eyes and saw a man standing over against him with his sword drawn in his hand." (Joshua 5:13) This figure, who identifies himself as a messenger of the Lord, brings God's instructions to Joshua, telling him to order his troops to march around the walled city of Jericho and destroy its inhabitants. Bol drew the messenger reaching out his hand, his piercing gaze fixed on Joshua off the sheet. Bol transformed the messenger from a prophet-like figure into one of supernatural dimensions. The man's heavenly aureole penetrates the surrounding shadows, rendered with tones of gray wash that intermingle with the white paper underneath. His flowing garments, drawn with loose, sketchy strokes, match his long hair and beard. 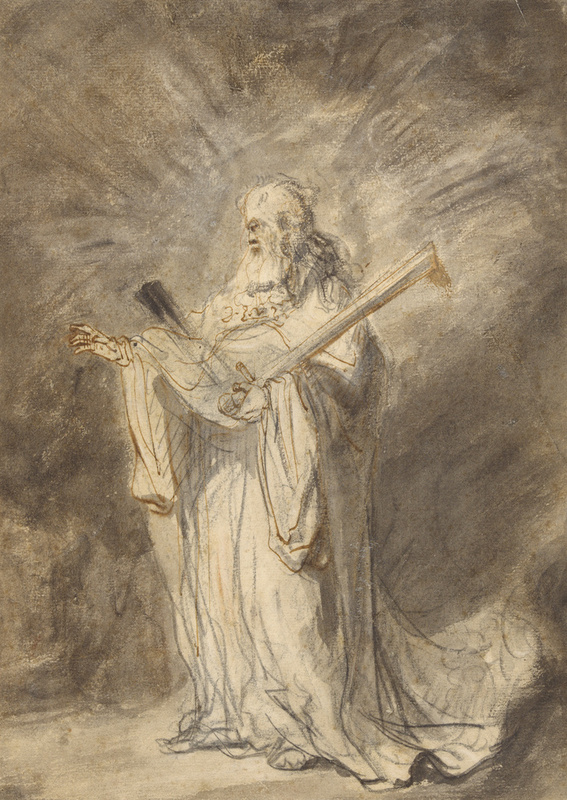 The plain white texture of the paper forms the highlights on his robes, emphasizing the light that seems to isolate the figure from the darkness beyond.